Mum’s winter remedy for good health! 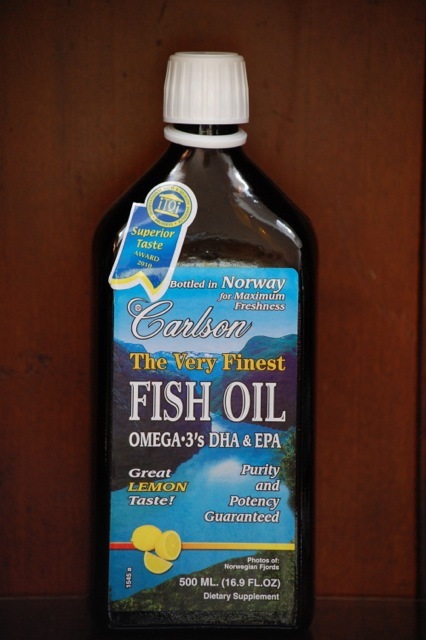 Today, I took a tablespoon of Carlson fish oil. As I raised the spoon to my mouth, I realize I was standing in the exact spot in the kitchen of my new/old home where my mother stood and went through the identical ritual every winter morning of my elementary and high school years (1960s to mid 70s). My mother poured her Carlson Cod Liver Oil (which, in those days, was not lemon flavored as my Carlson’s Fish Oil is today!) from the brown slouch-shouldered bottle into a tablespoon, and without hesitating to think of the overpowering fish flavor, she quickly swallowed it. Immediately, she’d chase it with a small glass of juice. She’d line up on the counter small yellow cod liver oil tablets for us to chew after we’d finished our breakfast and as we hurried out the door to catch the bus. This, and opening the windows for 10 – 20 minutes every morning, is how she kept us healthy in our childhood. Bottoms up, Mum, and thanks! Do you know the brand name of the yellow cod liver oil tablets? My mum gave those to me in the 1960s. The tabs tasted good. I’ve been trying to find out the brand name. I don’t remember the brand of the yellow tablets…I think I’ve always thought they were a Carlson product. I’ve just googled and can’t find them but I came up with old images. The company in these images is Whites. So I was probably wrong thinking they were distributed by Carlson. They both just show images of ads from back in the ’60s (probably) but I can’t find anything from now except other variations of tablets for fish oil.